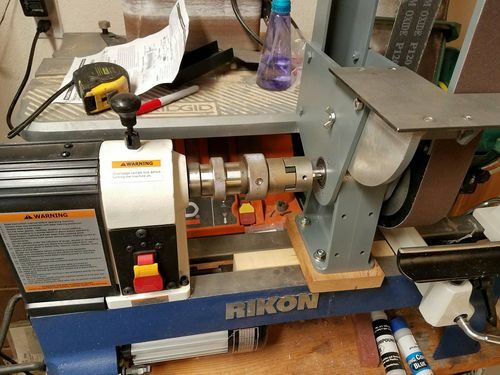 Sharpening lathe tools with a belt sander? So first off thanks for any advise in advance and also I know the first thing folks might want to say is get a slow speed grinder but there is no way that is happening right now. So here is my question I have a porter cable belt sander and need to get some usable results while sharpening by turning tools. Does anyone have any advise? the biggest risk is that it will overheat and ruin the temper on your steel very quickly. So quick touch, quench in ice water, quick touch, ice water…etc….until sharp as you like it. I started out sharpening with same style belt sander, made a little wooden stand that could clamp to work bench which worked okay. Moved on to 6” 3450 RPM bench grinder & wolverine system, been using that set up for over twenty years. Only tip have for you is use a light touch when sharpening your tools whether use belt sander or bench grinder. Don’t need or want to quench HSS tools in water! I have a few more toys now, but I started with a one inch Delta. It did a beautiful job and it was quick and reliable. My results were hit and miss. Fortunately, more hit than miss. The ONLY reason I don’t use it as much is, I have a four wheel system with CBN wheels I can slow to a couple RPM’s, if I want. 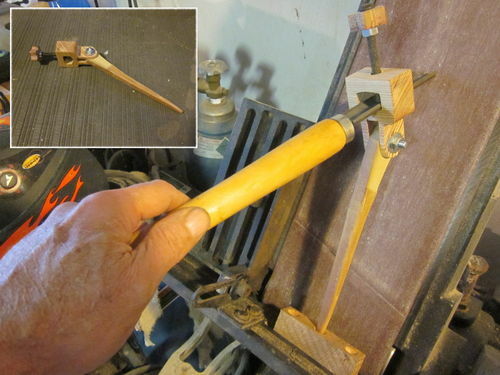 It’s still great for quick touch ups because it’s five steps closer to the lathes than the four wheeler. If you overheat the metal, don’t quench it, if you’re using high speed steel [HSS], which is preferred for lathe work. Quenching is said to fracture the HHS. That said, the advice to use a light touch is good. I like flat bevels. Use a disc sander myself. Now that I’ve turned a little and sharpened a lot, one rule I have is, my sharpener cannot, in any way, be tied to the lathe. That is for the same reason I don’t own a ShopSmith. More specifically, sharpening is, more often than not, a seconds operation. Having to spend minutes setting it up kills the joy. I really like the looks of the one in the photo above, but I’d look at powering it some other way than the lathe. Nowdays, I have a four wheel grinder with CBN and diamond wheels. The rig is driven by a commercial sewing machine motor, so I can vary the speed from zero to about twenty-four hundred RPM’s. Too, I can reverse the wheels. I also have a one inch belt sander and a buffing station. The CBN wheels have the Oneway sharpening jigs under them. In short, I’m covered on the sharpening end. Even though I have the Oneway jig system with CBN wheels, I, very often, just turn around and touch up tips on the 1” belt sander. A seconds job. When I need or want to change the profile of a knife, or if it’s been abused enough by my sharpening methods, then I’ll go to the jigs. 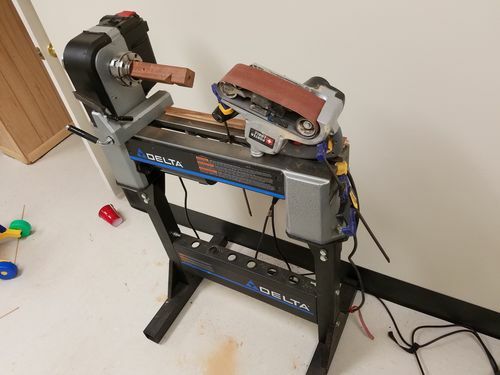 So, in the end, a belt sander (e.g., 3-1/2×21) should do just fine. I wouldn’t go more coarse than, say, 220.